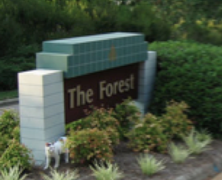 The Forest sign has been in need of a make-over for some time, and the HOA Board of Directors is ready to take action. After reviewing several options, members of the Board are leaning towards a proposal by Rodney's Sign Company that incorporates synthetic stucco. What is your opinion on the stucco look? ...the color scheme? Any suggestions or comments, even if just one word ("Terrific" or "Fine") would be greatly appreciated! The Board would like to hear from as many homeowners as possible. Please respond by June 1st. Comments will be posted on our HOA website, WWW.THEFOREST.ORG. Your HOA Board members: David M., Cliff, Bob, Kristy, Dave B., Kristen, Peggy and Terri. p.p.s. Not using email? Just drop a note to Dave Berger (211 Pocono) or to any other Board member.. Your opinions matter!